For use with: ‘any’ Windows software application. About the User: This project was commissioned by a client who hires out large industrial construction equipment to private building contractors. This includes delivery of the equipment to site where a hire period may be just a couple of days or several months. Project Brief: The client uses a Microsoft Access-based system to manage their customer and equipment lists, equipment hire bookings, etc. The issue that the business faced was that very often addresses and postcodes entered into the system were incomplete or inaccurate (particularly when delivering to a brand new site which may not be listed on Post Office records or satellite navigation systems) resulting in drivers being unnecessarily delayed in delivering equipment. In order to make the delivery of equipment to site more efficient, the client wanted to improve the way that addresses are logged in the system and provide Users with a tool to help verify the accuracy. 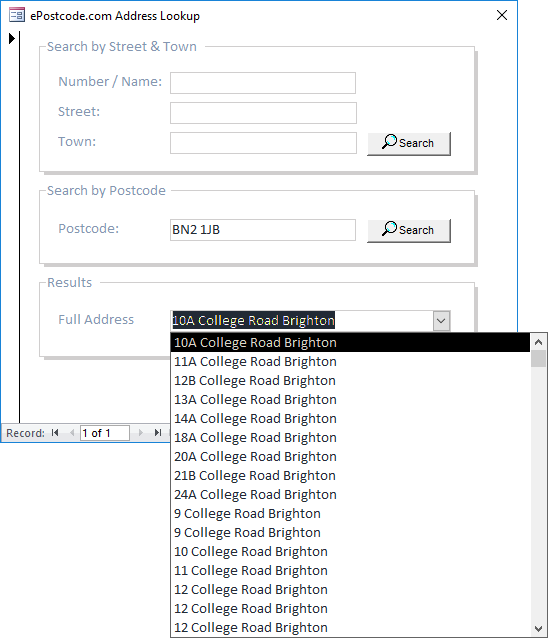 Options to search an address by street and town or postcode. ePostcode.com integration to retrieve addresses. A solution built within Microsoft Access but which may be reconfigured to work with ‘any’ other Windows software application. Minimal training required due to the highly intuitive User interface for searching addresses.